When a mortal mind breaks through the inertia of animal legacy and attains the third circle of human intellectuality and acquired spirituality, a personal angel (in reality two) will henceforth be wholly and exclusively devoted to this ascending mortal. The angels develop an abiding affection for their human associates; and you would, if you could only visualize the seraphim, develop a warm affection for them. Divested of material bodies, given spirit forms, you would be very near the angels in many attributes of personality. They share most of your emotions and experience some additional ones. All seraphim have individual names, but in the records of assignment to world service they are frequently designated by their planetary numbers. The guardian seraphim are not mind, though they do spring from the same source that also gives origin to mortal mind, the Creative Spirit. Seraphim are mind stimulators; they continually seek to promote circle-making decisions in human mind. They do this, not as does the Adjuster (fragment of God dwelling within us), operating from within and through the soul, but rather from the outside inward, working through the social, ethical, and moral environment of human beings. Angels are so near you and care so feelingly for you that they figuratively "weep because of your willful intolerance and stubbornness." 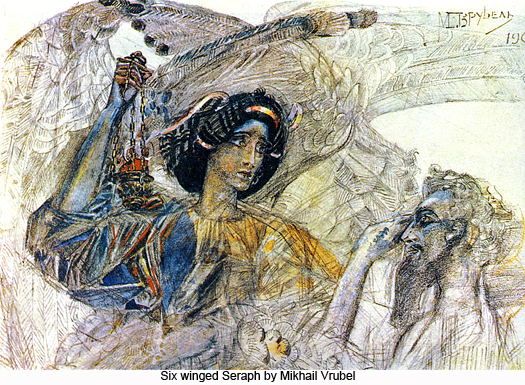 Seraphim do not shed physical tears; they do not have physical bodies; neither do they possess wings. But they do have spiritual emotions, and they do experience feelings and sentiments of a spiritual nature which are in certain ways comparable to human emotions. In the life of the flesh the intelligence of angels is not directly available to mortal men. They are not overlords or directors; they are simply guardians. The seraphim guard you.